I am a lemon lover. So is my dad and so is my brother-in-law. For the majority of our holidays or birthday celebrations with family, we always seem to have a lemon dessert. The first time I made this cake was about 10 years ago. At that time, I could not find lemon curd anywhere in my grocery store. This turned out to be a good thing in my opinion. I was forced to make my own. And while this is one of those steps that you may not want to do, it is so worth it!! Lemon curd doesn’t take long to make, but you do have to babysit it at the stove. It isn’t hard to do though. I’m telling you…it is so worth it. You will actually pour this into the cake and it will bake up producing a lusciously, moist, lemony layer. I made this cake the other day for my co-workers…mostly men. Currently I am working at the family fabrication business until #4 is born. This works out well lately, since they will usually give me their honest opinion, and I have somewhere to give my desserts away so I don’t eat them all. Well, when I brought this cake to work, I heard a few say they were not a big fan of lemon. I told them to just try it. Well, in just a short time, they polished off the cake! Some went and got a second piece….but I thought you didn’t like lemon I thought as they scraped their plates clean. I love it when that happens! This recipe comes from one of Sandra Lee’s Semi-Homemade cookbooks. I found the Lemon Curd recipe from Alton Brown…like I said…this step is so worth it. *Makes just the right amount for both the cake and the glaze in this recipe. Make your own double-boiler, by adding 1 inch of water to a medium saucepan. Bring to a simmer. In a metal bowl that will fit in the saucepan, combine egg yolks and sugar and whisk until smooth. Juice lemons into measuring cup until you get 1/3 cup of juice. If necessary, add water to reach this measurement. Add juice and zest to eggs and whisk. Place bowl onto saucepan making sure bottom doesn’t touch water. Keep whisking until mixture has thickened. This will take about 8 minutes. When it is ready, it will be light yellow and coat the back of a wooden spoon. Remove from heat and add butter one tablespoon at a time making sure it melts before adding another. Pour into a plastic container and cover with a layer of plastic wrap directly onto surface of the curd. Preheat oven to 350 degrees. Spray a 12 cup bundt pan with baking spray. 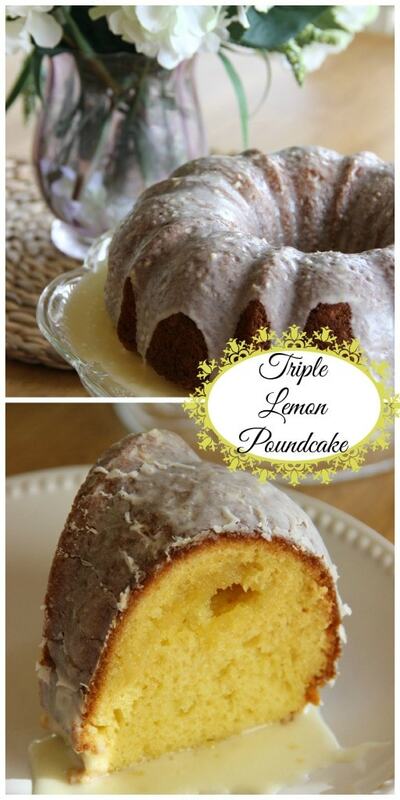 Combine all cake mix ingredients except lemon curd. Beat for 2 minutes. Pour into prepared pan. Drizzle lemon curd onto batter being careful not to let it touch sides of pan. Bake for 45 minutes or until toothpick comes out clean. Cool in pan for 15 minutes. Invert onto cooling rack to cool completely. Transfer cake to serving platter when ready to glaze. Make the glaze, by beating curd with water and lemon juice until smooth. Add powdered sugar and beat until smooth. Drizzle glaze over cake. It’s perfectly fine if you have a pool of extra glaze. Everyone will love it! I am so glad I am subscribed to your blog. We must have the same taste in food because I have saved almost every recipe. (I might have missed a few) So I just wanted to say thank you for all the hard work that you do. My family thanks you for all the good food too. So sweet of you! Thanks, you made my day! I absolutely love sharing recipes. I love lemon, it’s my favourite citrus to bake with. Your cake looks delicious. Visiting from Saturday Night Fever link party. I co-host Sweet and Savoury Sunday and would love for you to stop by and share you recipes with us. We’d love to see you there when the party goes live tonight! Have a great weekend. Looks so moist, delicate and light! I LOVE lemon and especially lemon curd! Thanks so much for sharing this at Saturday Night Fever!! I love this cake…I followed the recipe, and made it for Brunch at my church, it was a big hit. Thank you! I want to try the Bacardi rum cake for Christmas(lol). Hi Natalie! So glad you enjoyed it! We love that one too!